Description - Journey to the center of the solar system with this unique and educational flooring option. These flexible vinyl tiles feature a hidden interlock so that the graphic design of the floor is uninterrupted and no messy glue is needed. 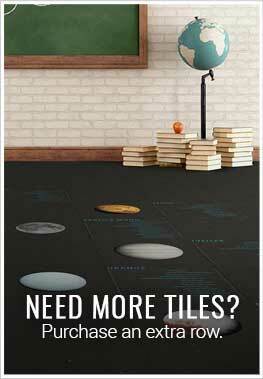 This solar system flooring kit can be installed on any level of the home, in schools and museums, and contain no VOCs or contaminants. Recommended Uses – Solar System flex tiles are recommended for use in spaces for youth where learning is encouraged, in spaces such as schools, libraries, day cares, museums, waiting rooms, bedrooms, gamerooms, and more.